At DNS Accountants, we work to offer the best solutions and services in accounting, tax planning and consulting services for various businesses, companies, freelancers and contractors to help you have an efficient and transparent financial system supporting your business. Since 2005, we have helped more than 1200 clients with various issues involving accounting. We specialise mainly in Limited company accounting, tax advice tax investigation, tax planning and accounting services and have a strong team of professionally qualified as well as experienced accountants to help you out with anything that adds wrong in your accounts. With our strong team of Accountants in Halifax, Coventry, Harrow, Watford, Reading and Euston, DNS Accountants have successfully gained recognition locally. The year 2013’s British Accountancy Awards is a clear reflection of our work in the field. 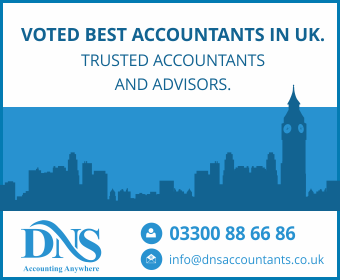 We, at DNS Accountants, have a range of unique services that makes us stand out in the area. With the Free Online Accounting Software Nomisma, you can access all your accounting data and records online and that too in real time, ensuring complete transparency of your accounts. With quick and efficient response you need not ever worry about deadlines or last dates, with our team behind all your account works. We also give three months free service so that you can understand how all we can potentially help you out. Our team of skilled and professional chartered accountants in Halifax provides consultancy in account improvement, corporate finance, corporate tax, etc. and can also help you out with matters regarding accounting and company secretarial services. With utmost dedication, commitment and quick response time, our team is packed with the best accountants in Halifax. Creating accounts, calculating tax and other reports would soon vanish from your worry list once you seek the assistance from our accountants. Our team of experts assists you in a range of tax advisory services, tax planning and payment. We work simultaneously on both the personal as well as the corporate taxes so that both the scales of your life are in perfect balance. Depending upon the type of your business, we work to provide custom made solutions for every problem that you face in the name of tax. Our team of tax accountants in Halifax have an impressive experience in dealing with large corporate companies, rising start-ups to individual entrepreneurs. With the right choice of an accountant and perfect tax planning, you sure can cut down a lot on your liabilities and taxes. Management Accounts Services are used to study the financial performances and trends, charting out various elements such as sales, cash flow, balance sheet and profit-loss forecasts. Various trends, comparisons, and implications are drawn out by matching with previous year data. At DNS Accountants, we offer Management Accounts Services in different packages. As per your requirements, you can opt for either standard premium or gold services. The standard package costs around £ 150 p.a. This investment will help you save a lot of money and time and is a tax-deductable expense. Our team of skilled accountants in Halifax work hard to provide easy and cost-effective Management Accounts Service. First of all, we add your business to our online accounting software, thereby giving us a real-time access to your accounts and performances. With this data, our expert team would be able to figure out various elements such as profits, cash flows, financial trends, etc., to help you with all the financial aspects of your company. You can also set up targets and milestones and plan efficiently to achieve them. So use this service to have a timely and efficient management decision for your business. P46, P45 and year-end payroll returns; P35 administrated by DNS Apart from that, they also offer a free trial run for a month. Also, there are no charges for new starters or leavers. Thus, DNS Accountants work hard to achieve perfect financial balance for all our clients. We provide contractor accountants in Halifax who will take care of all your accounting needs in a personal and effective way. Our services are now also available in Bradford, Leeds, Huddersfield, Shipley, Pudsey and many other areas in the United Kingdom, thereby extending the range of our valuable service. Our team of Accountants in Halifax work with the sole purpose of serving our clients in whichever way possible in all of the fields connected to accounting. Whether it is account management, tax planning, business forecasting or fund management, we, at DNS Accountants strive to help you attain success in your business venture.